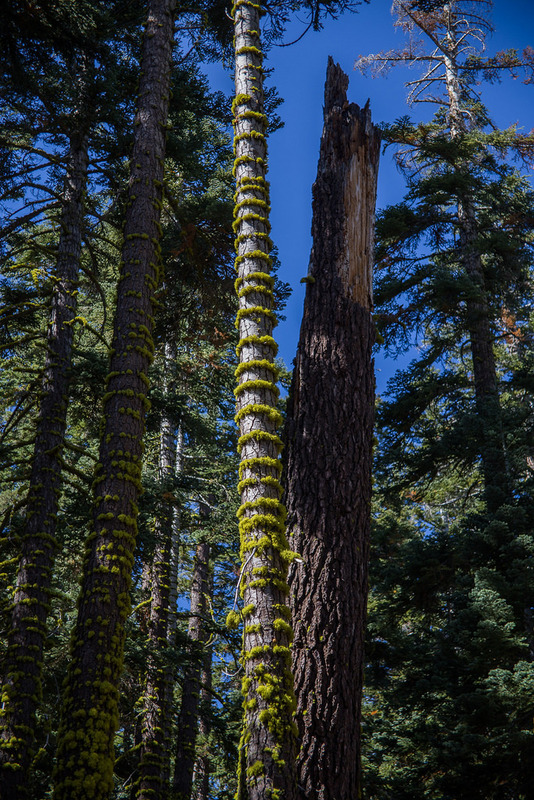 It was about 260 miles from the campsite on the Trinity River to Lake Tahoe. We broke up the drive by stopping in Chico, where we went for a dusty run and visited the Sierra Nevada brewery. We would have liked to go on the tour, but with the temperature above 90°F (and no clouds in sight) we couldn’t leave Porter in the car for long. Just enough time for a cold beer in the sweltering biergarten. The climb into the mountains was a welcome change from the vast flatness of the Central Valley. Driving through Yuba Pass offered some amazing vistas of the Sierra Nevadas (whenever there wasn’t a massive Montana, Raptor, Cougar, etc. blocking the view, which was not often). 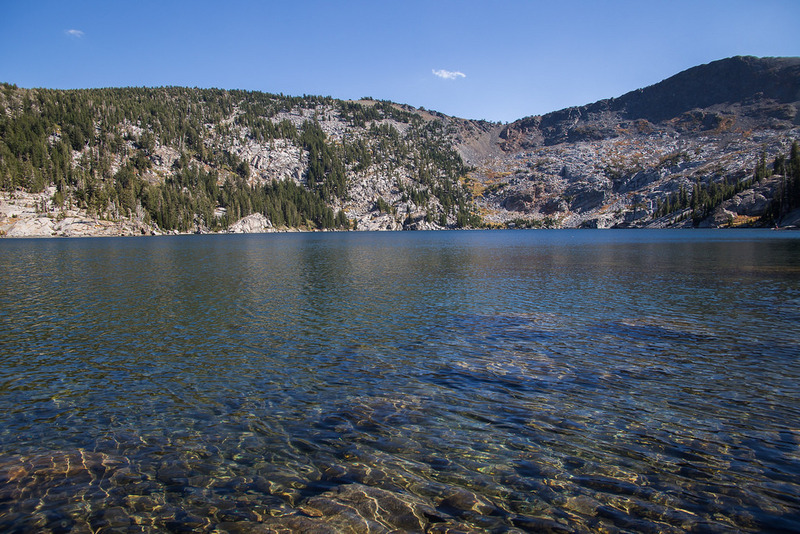 We didn’t do a lot of planning for Lake Tahoe, and only decided on the drive over to check out the Desolation Wilderness, which required a permit. It was too late to get a permit that night, so we had to find a place to sleep and then pick up a permit early the next morning (fingers crossed, apparently they go fast). 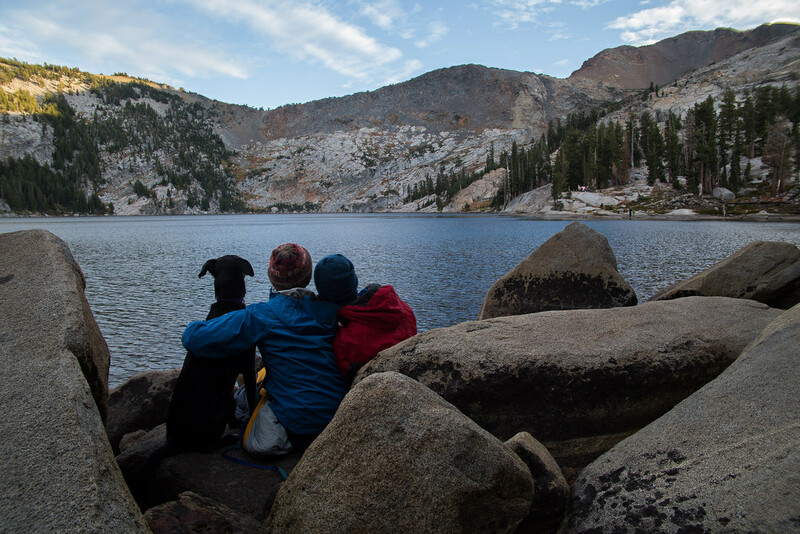 Our thought process went like this: Lake Tahoe is surrounded by mountains and sparsely populated, so if we find a trail we can just follow it into the woods and camp there. It won’t be sketchy at all. Screw paying for one of those overpriced lakeside campsites. We did manage to find a trail which snaked between some ski condos, but the only flat ground was just barely hidden from the houses, and definitely not a quarter mile from the trailhead (backcountry camping regulation). Dinner involved baked beans, and I forgot the can opener in the car. So I had to run by the houses twice more to retrieve the opener…so much for being inconspicuous. Even better, once we had set up camp and finished dinner, it was only 6 PM. That’s what happens when you don’t plan. 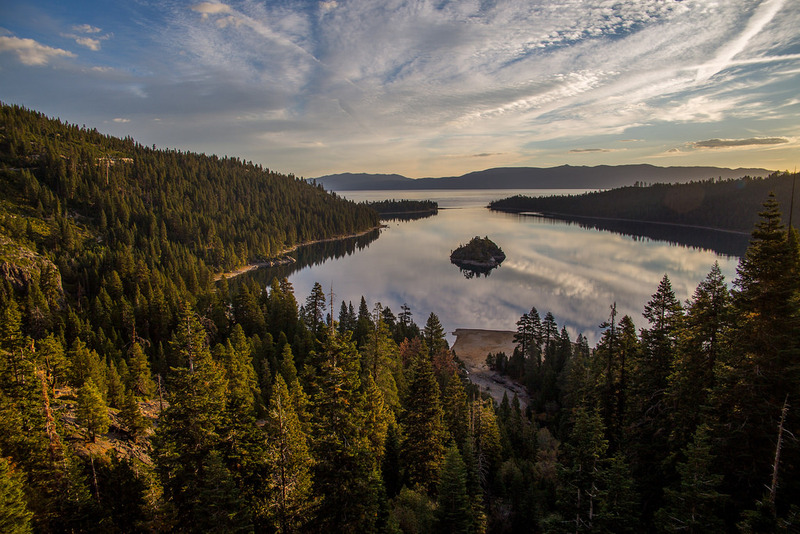 We hustled out of there the next morning and took a serene cruise along the western side of the lake, stopping at Emerald Bay to watch the sunrise. There were a few other hikers at the ranger station, and we had no trouble obtaining a one-night permit for Dicks Lake. The ranger actually went to UNH…funny how when you’re on the road and far from home, any little connection is cool. When we were getting ready to run in the Willamette National Forest, some people saw our license plate, and yelled something to the effect of “You’re from New Hampshire? We’re from New Jersey!”. Close enough when you’re in Oregon, I guess. 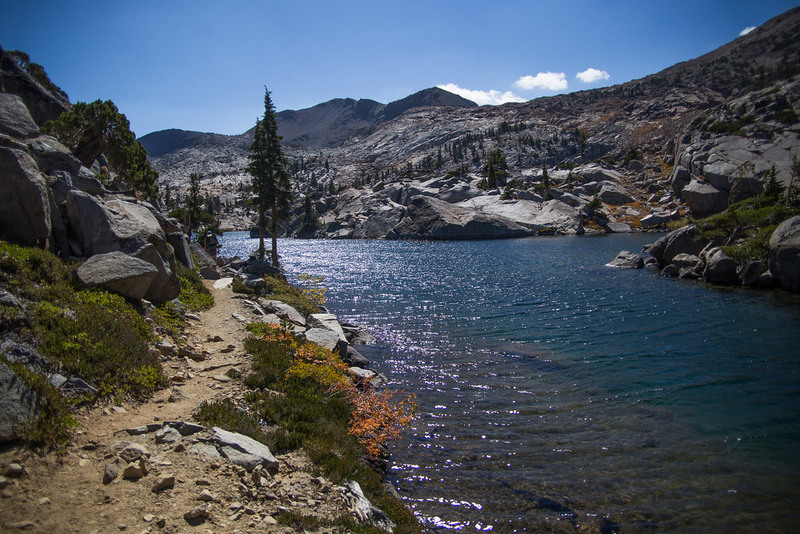 The Desolation Wilderness is neat because they limit the amount of hikers, even going so far as to assign groups to certain areas for camping to preserve the sense of isolation. 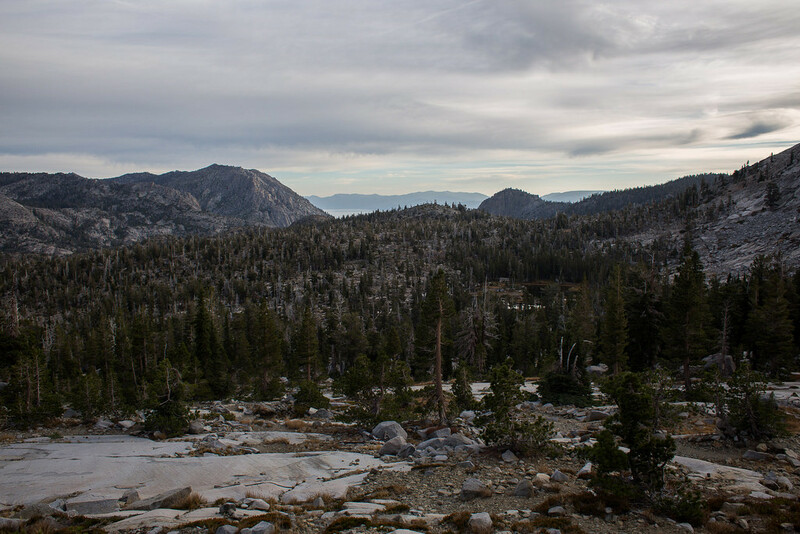 “Desolation” is a fitting name, the landscape strewn with gray boulders and dead, gnarled trees. Don’t be fooled though, it has a bright, magical side to it; lakes filled with tropical blue water, trees with stratified green rings of moss, and radioactive pink sunsets. We wound through the hills, following the sandy trails from lake to lake. When the tent was set up, we headed down to the lakeside. Becca wrote in her journal and sunbathed while I gave swimming a shot. Dicks Lake sits at 8,420′, so it is really cold. A man fishing near us told me to stay in for a few minutes, your body will adjust, he said. This was probably the coldest water that I have ever swam in without jumping out immediately, and it was incredible; a bizarre feeling equal parts numbness and vitality lasting all of four minutes. We ate dinner by the water and watched dusk turn the granite pink. I stayed up late for the stars, but the moon made it tough to get a good picture. However, the bright moon lit up the landscape and made for some good reflection time. We headed out early the next day to beat the crowds, and didn’t see a single person until we got to Maggies Peak (at the edge of the wilderness area). Next stop: Oakland. I didn’t think California would require three posts, but I don’t want to make this one too long.